ENR SW recognized JBH for two important accomplishments at its Best of 2012 Awards luncheon held on November 27th in Phoenix, Arizona. JBH President John Stroud accepted the Top Specialty Contractor of the year award celebrating revenue growth, industry advancement, and community involvement. 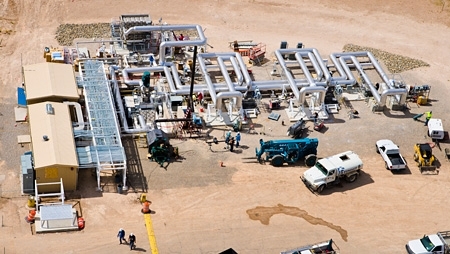 Additionally; owner, engineer and contractor personnel were present to receive the Best of 2012 project award for the Sandia National Laboratories Molten Salt Test Loop project. Members of JBH AZ and New Mexico offices were in attendance to commemorate this celebratory event. 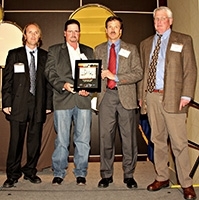 Above: Molten Salt Test Loop Project Team accepting plaque at ENR Awards in Phoenix. 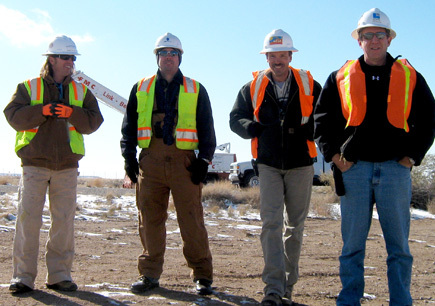 (L to R) PM, Jeremy Byington, Piping Superintendent Bill Brown, Owner’s Representative Bill Kolb (Sandia National Laboratories) , Mechanical Engineer Dwight Dorsey (Bridgers and Paxton Consulting Engineers). Below: JBH President John Stroud accepts the award for Specialty Contractor of the Year with support from JBH NM and Arizona offices and key industry partners. JBH donates $74,687 to the 2013 United Way Campaign! JBH employees throughout each of our area offices; Rio Rancho, Los Alamos, and Albuquerque, NM; and Chandler, AZ have pledged over $64,000 to help support community members in need through the UW of Central New Mexico, UW of Northern New Mexico, and Valley of the Sun UW. Additionally, as a proud Corporate Cornerstone Company, JBH has added $10,000 to the employee contribution to total a $74,687 contribution to the 2013 fundraising efforts! Thank you to everyone who initiated or continued their annual pledge, with our joint efforts we can see measurable change in our communities! The Associated General Contractors NM Building Branch named JBH EH&S Manager Barbara Spitz Committee Chair of the Year for her work on the AGC Safety Committee, a group that meets regularly to assess and improve construction safety practices throughout the industry. 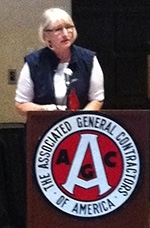 The mission of the AGC-NM Building Branch is to provide a forum through which members, with staff, can: (1) Collectively solve problems we all face, and (2) Develop programs designed to improve the well-being of the construction profession, the communities in which members live, and the profitability of our own businesses. In so doing, the ethical standards embodied in the phrase, “Skill, Integrity, and Responsibility” are promoted and followed. 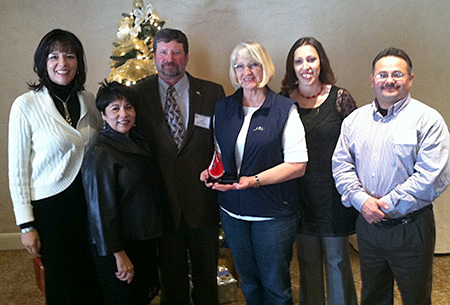 Barbara received her award at the AGC-NM Building Branch’s annual Appreciation Luncheon held December 3rd, 2012 at the Hotel Andaluz in downtown Albuquerque. (L to R) JBH VP, Corporate Support Maria Guy, AGC-NM CEO Vicki Mora, AGC 2012 Board President Larry Franken, JBH EH&S Manager Barbara Spitz, JBH Marketing Admin Melissa Gomez, JBH Project Manager Chris Romero. J.B. Henderson Construction Company Inc. (JBHCC) has promoted John Michael Stroud to President of the company. Mr. Stroud has worked for JBHCC for 24 years, serving as Laborer, Plumber/Pipefitter, Estimator, Project Manager, and most recently as Rio Rancho Area Manager. Mr. Stroud has served as project manager on notable JBHCC projects including UNM’s Pete and Nancy Domenici Hall and the National Security Sciences Building for the Department of Energy at Los Alamos National Laboratory; both award-winning projects. Additionally, Mr. Stroud has led project teams to complete important contracts for the local micro-electronics industry, consistently contributing to JBHCC’s safety, quality, and profitability goals. Mr. Stroud holds a BS in Construction Engineering from the University of New Mexico and completed a five year piping apprenticeship from LU 412 Plumbers and Pipefitters. JBHCC is confident in Mr. Stroud’s ability to lead the organization in living out its core values of honesty, integrity, safety and quality. The JBH Albuquerque Area, led by Area Manager Dorian Atwater, has received a respected industry award for their completion of the Sandia National Laboratories Molten Salt Test Loop Project. The project was managed by Project Manager Jeremy Byington and Mechanical Superintendent Bill Brown and professionally constructed by the Albuquerque Area’s fine team of tradesman. ENR SW judges considered over 138 entries in multiple categories and out of the 33 winning projects throughout AZ, NM and NV the Molten Salt Project was named Best of 2012 in the Specialty Contracting category. This project was truly an industry leader and a model of JBH’s project management and technical capabilities. 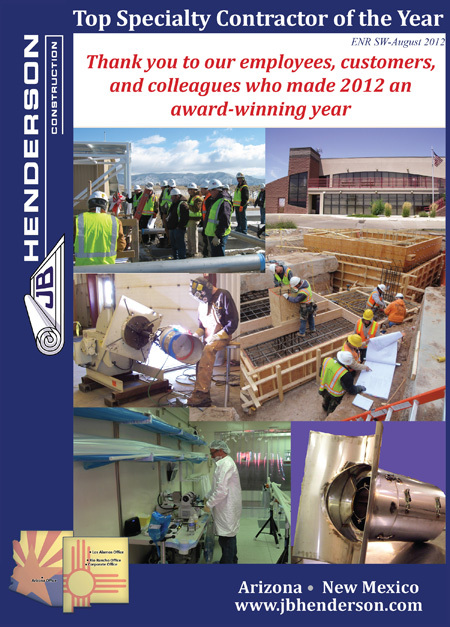 The editors of Engineering News Record have voted JBH the Specialty Contractor of the Year for the SW region based on our mechanical contracting revenue increase from 2010 to 2011, JBH community involvement and overall organizational performance! This is a great honor for the company and possible only because of the incredible field and administrative employees who make JBH run daily. On Wednesday, July 25, 2012, JBH received the first ever QUALITY CONTRACTOR OF THE QUARTER Award as given by our microelectronics customer and the site’s construction manager. JBH earned this award through a lot of hard work and dedication by our project teams. Candidates for this award were and continue to be measured through various metrics tracked by the owner and construction manager, and JBH has consistently come out on top! The field supervision working side by side with our BIM team. They worked through the BIM/design process with patience and commitment. Not putting work in place until it was modeled and had been issued for fabrication and approved by the customer. By sticking to this discipline, even through the schedule pressures, it enabled us to deliver an accurate model to our customers and to our fellow subcontractors coordinating their work around us. JBH maintained a excellent record of Quality Observation Reports and Audit results as recorded by our customers. Time after time they observed clean and professional installations of the work by our field team. Our field team worked well with our QA/QC crew to ensure that the work was checked throughout the building process using incremental checklists and clean system turnovers that were verified to plans, specifications and the coordinated construction model. The customer stated that due to this consistent performance the decision to give us the award was clear and without question. In addition to being recognized with this award at an important site meeting, our entire AZ team will be receiving a celebratory pot roast lunch and tokens of appreciation from the owner and construction manager. Albuquerque, New Mexico – Jack B. Henderson Construction Company Incorporated (JBHCC) has hired Aaron Armijo as a Project Manager to support work for their Albuquerque operations. Aaron holds a BS in Construction Management from the University of New Mexico and has 17 years of experience working for general and specialty contractors in New Mexico and Texas. 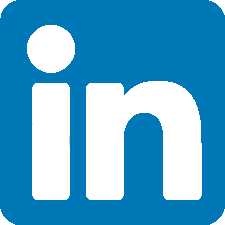 Chandler, AZ – Jack B. Henderson Construction Company Incorporated (JBHCC) has hired Erynn Smart as a BIM/CAD operator to support work in their microelectronics sector. Erynn holds a Bachelor of Applied Science degree from Northern Arizona University and brings extensive design experience to JBHCC’s BIM department. J.B. Henderson Construction Company Inc. (JBHCC) has hired the following personnel to support work for our customers in the regional microelectronics, government and commercial construction sectors; Ben Davis– Arizona Area Manager,Dale Glines– Corporate BIM Manager, Gerardo Guerra– Northern New Mexico Safety Representative, Angela Hylsky– Albuquerque Area Project Coordinator,Beth Kealy– Northern New Mexico Project Manager, Greg Masterman– Albuquerque Area Superintendent, Darline Mora– Arizona Safety Representative, and Denise Wadkins– Human Resources Manager.